T.K. 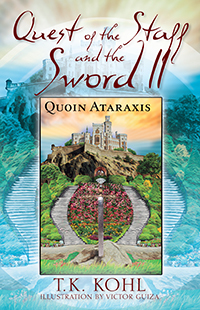 Kohl’s “Quest of the Staff and the Sword, II: Quoin Ataraxis.” In this compelling second installment of the young adult Quest of the Staff and the Sword saga, the balance of power tilts toward darkness. Luke manipulates the world’s media with deceit and is able to convince the world that they are in danger from “the hooded man.” He will attempt to use his power not only to destroy the hooded man but also to immobilize the people of the world. Luke’s darkness grows in him, and the fate of the world trembles in the balance. Meanwhile, can “the hooded man” protect the Jedidiah family and can he inspire them to join him on his quest? Can ‘the hooded man” establish the foundation of peace, save those who wish to be saved, and assure those around him that all will be well?